Parchment · 20 leaves · 867 – 900 CE · Lyon ? 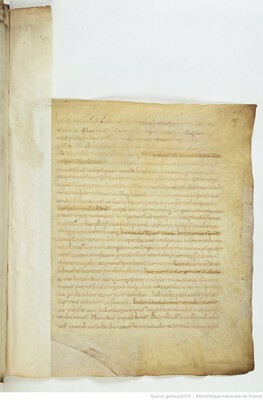 Lyon's City Library and Paris' National Library share parts of a lost copy of a Commentary on psalms, written in the last third of the IXth century. André Wilmart, who first suggested the rapprochement of these fragments («Fragments carolingiens du fonds Baluze», dans Revue bénédictine 43, 1931), couldn't identify the text or its author, although he suggested Smaragdus. Cf. Bischoff, KFH II, 2584.